On Friday, we passed along a report that said communications app Google Hangouts was going to be shutdown for consumers in 2020, and would be turned into a platform for business users only. 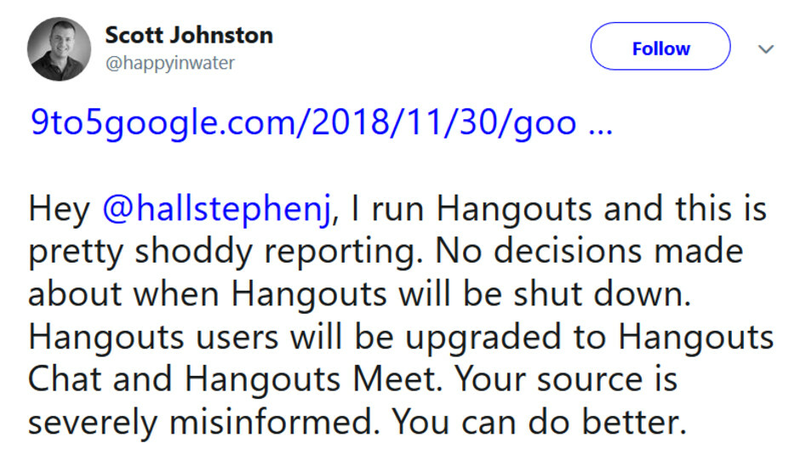 However, a tweet disseminated yesterday by Hangouts product lead Scott Johnston took a shot at the original source of the story, stating that Google has yet to make a decision when Hangouts will close. According to the tweet, Hangouts "classic" (as it is called internally) will indeed be eventually closed to non-business users. Johnston says that before it does, these Hangouts users will be migrated to the Hangouts Chat and Hangouts Meet apps. Chat allows users to communicate via Direct or Group Messages, while Meet is a video chat service that can allow up to 50 participants to meet together via video (in G Suite Enterprise Edition). Johnston tweets, "Right now it (Chat and Meet) is only available to G Suite accounts, but before we migrate consumers, that will change." In a separate tweet, he wrote "Migration should be automatic and should be invisible to you as an end user." When the migration does take place, Google members will be able to use Allo and Hangouts Chat for messaging, Duo and Hangouts Meet for video chats. However, those two Hangouts apps lean more toward group messaging and video. So confusing because of so many damn applications that do the same thing. Lol nailed it Google. Tear it down and create 2 more apps. Allo and... Well crap.. that other app must've been super successful, right? 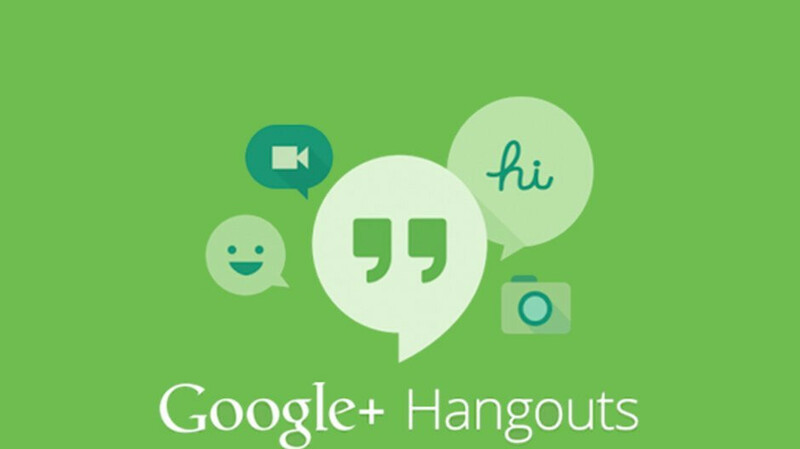 Does anyone know what is “Hangouts”? I remember having such an app and 2 minutes later deleting it. PS: google must be crazy, if it thinks business have nothing better to use but Hangouts. Is the best cross platform messaging app that allows you to chat from all your devices without the need to link the app like whatsapp and Viber. You mean like Skype (Teams, if we’re talking businesses) or slack? Hangouts is far superior to Skype in every way. The quality and functionality is way better. Maybe when you’re mother tells you to buy groceries or you WiFi call her because you don’t have credit on your prepaid. As an iMessage fanboy and unabashed iSheep you should just shut up. We've had this debate before and Hangouts is THE most comprehensive messaging app available. Do Apple have an equivalent business app? Unfortunately Google have their heads up their collective a$$es and don't know what the heck they're doing with their messaging apps. The Johnston guy is an even bigger moron since he's not really said anything of substance in his statement. I've moved my Google Voice numbers back to the GV app already because they could do it next week knowing Google. There’s a dude on this site that I have taught to blow (in the wind, of course); be polite when you’re talking to me and don’t try to take his place. Not everything is about google and apple: I use Skype for business (I use a s**tload of Microsoft products on my iPhone) because they’re so f**king good on my apple products. Hangouts is just a (distant) second choice; the last time I have tried it, I couldn’t search messages, couldn’t interact with them (forward, remove); on pc it’s easy to miss notifications (luckily you get emails), you have but 10 people with whom you can video call (25 for Skype), 100 people limit for im - it’s not much of an issue but it worth mentioning; I couldn’t share anything but pictures (I need to share docs with my teams); doesn’t had push notifications - you get notified by email though so you’re covered; no “seen message” option. Now, tell me again how good Hangouts is. I'll say it again, Hangouts is better than Skype. The fact that you don't know how to use it properly (or haven't taken the time) isn't my problem. I use Skype and Windows products extensively like most people do and I'm making a direct comparison too. Before you tell me how you want to be addressed, I suggest you take a good look at your own posts like the prepaid reference above. You should also work on your 3rd grade grammar and spelling. In the meantime I'll start the mudslinging and tell you to blow me. I have put a number of Skype's advantages; are they correct or I have made them up? PS: I know I write average in English language and I apologize if somehow I offend anyone (please feel free to correct me, I learn fast and I rarely repeat my mistakes). You may be correct but my problem with Skype is its reliability. It freezes, video and sound quality is a gamble and it's also very intrusive on mobile, constantly attempting to start in the background. All the features you mention are useless if the fundamentals are poor. Skype used to be good but Microsoft have screwed it up. PS: Your English is fine especially as a second language. I was just winding you up and you answered with class. Skype has indeed some problems with the functionality, but both video and sound are good (at least just as good as on Hangouts); I have it on an Android device, but I haven’t tested it so I can only tell you that the app on the iPhone is just as good as any other iOS app (I had indeed crashes on windows). Hangouts also has its strong points (like costs, it’s a bit easier to share the screen) but it’s still a distant second choice. I come here to talk about tech but I don’t mind if I learn other stuff in the process or correct errors in judgement I might have. What I don’t like is to be called names; we all have our favorites and are more or less biased, but that shouldn’t stop us from being polite with each other and give credit where it is due. Never cared about Hangouts when I had an Android and now that I've an iPhone with iMessage; I couldn't care less! But I do love and care about Android and I think it's is in dire need of a consistent IM platform that isn't handled by Facebook or Google. I just don't trust these two tech tycoons when it comes to personal information and secure communication. I wonder if RCS ever going to take off? Oh well, G'Day! Google is pushing the users of an amazing app over to an app which users are bashing in the reviews. THANKS GOOGLE!